Opera Link provides a similar option to synchronize data from Opera than Mozilla Weave does for Firefox. I don't want to start a discussion on who was first with that idea because something like this only matters to fanboys. The same can be said for comparing browser distribution. Rarst has a nice article up at his website about Opera 9.51 which is definitely worth a read. The advantage of Opera Link is that it is build into Opera like many other features that can only be added to Firefox with add-ons. 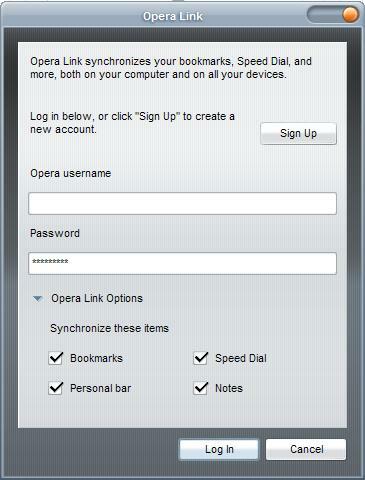 Opera Link can be used to synchronize Bookmarks, Notes, Speed Dial and the Personal Bar with an online storage at Opera. That storage can be accessed by other Opera browsers including Opera Mini. As a bonus the personal data can also be accessed directly on the Opera website which is excellent if you access the web from a computer that has no Opera browser installed. Using Opera Link could not be easier. The feature can be accessed in the File > Synchronize Opera menu and requires an account at Opera. The account can be created right from the menu and the only data that is required is a username, password and email. The transfer of the data is fast and I was not able to witness any delay in the process. The data will be continuously synced with Opera Link until the user decides to turn that feature off again. Bookmarks and the other data will be synchronized with every browser that activates the sync feature and provides the same user data that has been entered during account creation. The online version provides access to the bookmarks and Speed Dial links and even has an option to add new bookmarks. My blog is very new, but Opera really was first thing I wanted to write about. It’s very interesting app both from functions viewpoint and social viewpoint. but if you use Opera Link and this tweak – only first 9 slots going to be synced. Rarst thanks for the nice review of my blog. I know that I’m writing much about Firefox and tend to forget Opera but I try to do better in the future. And Tobey could probably add some posts as well because he is the die hard Opera user among Ghacks authors. No need for a discussion Opera was first period.